Laboratoire Matière et Systèmes Complexes - Séminaire Interne MSC. 24 septembre 2018. Anouchka PLan & Solène Song (MSC) : "Nanoparticles in intracellular environment" & "Evolution and development of vascular systems". Home page > Séminaires > Archives séminaires > Séminaires 2018 > Séminaire Interne MSC. 24 septembre 2018. Anouchka PLan & Solène Song (MSC) : "Nanoparticles in intracellular environment" & "Evolution and development of vascular systems"..
Nanoparticles are promising candidates for the future of medicine. By combining the effects of inorganic components with molecular constituents, they can provide a localized action minimizing side effects on healthy tissues. One of the application is the generation of a heating in order to destroy cancer cells. Firstly, magnetosomes, nano-ranged magnetite structures synthetized by magnetotactic bacteria, were for long considered among the best nano-heaters for magnetic hyperthermia, meaning heat generated through the application of a magnetic field. They were also found to be efficient nano-heaters when irradiated by a laser in a process called photothermal therapy. Besides, its genetic engineering enables its functionalization with specific targeting agents, such as the RGD-peptide, as produced here, to target RGD-responsive cancer cells. Is situ measurements of the magnetosomes heating efficiency in situ, within the cancer cells demonstrated an unreported massive decrease of heating of more than 10-fold in the cellular environment for magnetic hyperthermia. Cellular incorporation has no impact on the photo-heating making photothermia a competitive strategy. As a result, we were able to demonstrate a viable therapeutic thermal and targeted strategy with magnetosomes resulting in tumor regression in mice after injection of the magnetosomes in blood, and photo-treatment of the tumor. Secondly, gold nanoparticles (GNPs) are able to absorb light within the Near Infrared (NIR), window where light has its maximum depth of penetration in tissue, and convert it into heat. Within the present study we decided to control GNPs confinement to tune their optical absorption towards NIR wavelengths in cellular environment. We compared single and multi-core pegylated GNPs with commercial gold nanorods. We then compared their efficiency of photothermia in water and in cells. Multi-core GNPs photothermia competed well with most efficient photothermia agent for thermal efficiency in water. In cellular environment, a shift of the absorbance towards the NIR was observed, increasing the efficiency of single core and nanorods in the NIR, and having a small impact on multi-core GNPs. Finally, a gold therapeutic nanoplatform functionalized with alendronate, a drug known for its antitumor effects has been developed. In addition, the core made of GNPs brings thermal functionalities under irradiation. 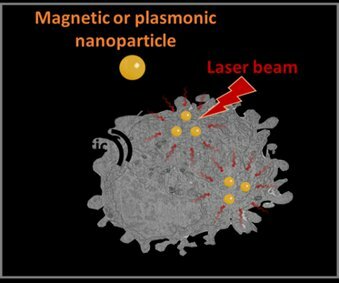 The nanoplatform thus provided a combined antitumor activity through drug delivery system and photothermal therapy. It inhibited in vitro proliferation of prostate cancer cells (PC3). Living organisms, when reaching a certain size, have developed a great diversity of solutions to transport nutrient, gas and waste actively. Our project participates in the effort of deciphering the evolution of the vascular systems in animals by studying the development of the vascular systems in two model animals at key locations in the animals tree, a jellyfish and a marine worm. In this presentation we are going to focus on the jellyfish Aurelia aurita. The jellyfish Aurelia aurita is equipped with a gastrovascular system which displays a branched pattern spanning the endodermal cells monolayer. It develops by radial centripetal growth from the rim and connection to neighbouring vessels. This network is an interesting model for describing the growth of a network in a growing and contractile environment : it is planar and relatively simple, the animal body grows homogeneously at a fast rate (up to 20% diameter increase per day), and the swimming movement is periodic and can be described using its rotational symmetry. The swimming movement imposes repeated mechanical constraints in the endoderm. We hypothesize that the canals in the endoderm form where the mechanical constraints are high to release the mechanical stress in the endoderm, an analogy with cracks propagation. We have acquired timelapse series of the canals growth and videos of the swimming movement. We quantified the pattern’s geometry and topology on the timelapse series and the local deformations from the videos. We showed that the topologies can be very diverse from one individual to the other, and that the swimming movement does not deform all regions of the endoderm homogeneously. The heterogeneity of the deformation field could explain privileged locations for reconnections, giving rise to this diversity of patterns in different individuals. This would be an argument in favour of an example of mechanics driven morphogenesis in an early diverging animal species.